La Entrada’s annual School Picnic gives families and staff the opportunity to kick off the new school year with yummy food and community building. 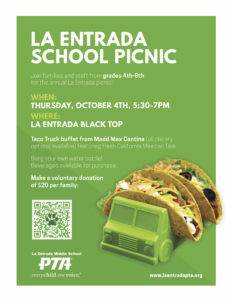 The 2018 Picnic will be held on Thursday, October 4 from 5:30 to 7:00pm on the La Entrada black top and field. VOLUNTEER RESPONSIBILITIES: Work with school administrators and facilities staff and coordinate with food vendors and volunteers for the event. Committee volunteers can opt-in for specific, day-of responsibilities. This is a great way to meet other volunteers at the beginning of the school year! La Entrada Middle School serves grades 4-8 and is located at 2200 Sharon Rd., Menlo Park, CA 94025. The office can be reached at 650-854-3962 during school hours. Copyright © 2017 La Entrada PTA. All rights reserved.